This past weekend in a the tiny town of Hempstead, Tx (watermelon capitol of Texas/population 4,700) I spend two days decorating for a wedding reception. This project has been going on for about a year and was held at the local Knights of Columbus Hall in Hempstead. The hall (like most reception centers) had rules: nothing attached to the walls or ceiling, etc... EEEEKKKKKKKK no attaching anything to the walls or ceiling!!!!! That was challenging. The bride and groom wanted a casual country wedding and specifically asked for mason jars, muted tones and burlap. UGH, that's not exactly "my thing". I am not a fan of mason jars or burlap, but it's not my day and that's what they wanted so that's what they were going to get. Plus I was going to come up with some thing to help break up all those gigantic white walls. A before picture. The solution for the walls, built two "Catina" type rustic structures to add some interest and appeal. Next concern was having enough room to seat around 500 guest. They had 450 R.S.V.P. 's plus bridal party and let's not forget all those that don't R.S.V.P. Pictured is one of the builds that was made a head of time and brought to the hall Friday. Pictured here is another built for the bar. The Catina as I referred to it. That rolling door REALLY bothered me. Thank goodness in the dark it wasn't that bad. Remember the reception is in a town of 4,700 people, they were expecting 500 guest. There are not many (or any other) choices of places to have your reception with the ability to hold 500. A few more before pictures, I thought it was a good idea to give you all a good idea of the BEFORE, then the AFTER would be really appreciated. It was a big job. Yep, those are wagon wheels. Another request they had, so I used them around the stage. The build at the back of the hall was 14 feet tall. The entry way opening was over 20 feet. The curtains were not part of the hall rental. They had to be made and a separate stand to hold the curtains had to be constructed (remember no attaching anything to the walls or ceilings). 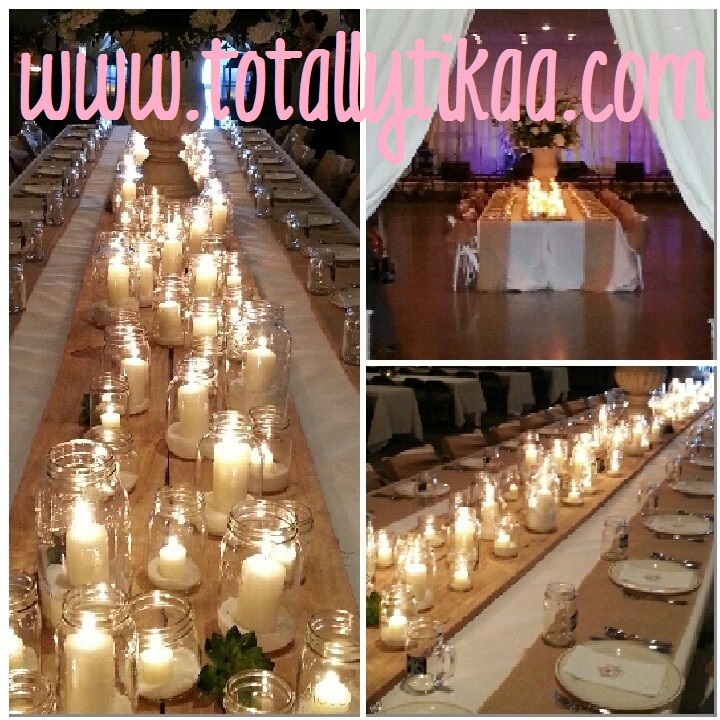 The head table was 24 feet long and once completely done had almost 100 mason jars and candles down the center. All the candles on the head table were real burning candles. 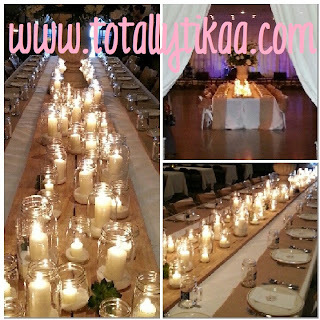 The guest tables had around 400 battery operated candles mixed in with the flowers, burlap sacks and wooden crates. Progress, the Catina over the bar was up, the lights were in and on, and the bar tables covered. I forgot to get a picture of the flower arrangements that hung down the front two poles of the Catina. I loved those candles, I found them in several different sizes and used them on the bar tables, at the bar, and a few other spots in the hall. 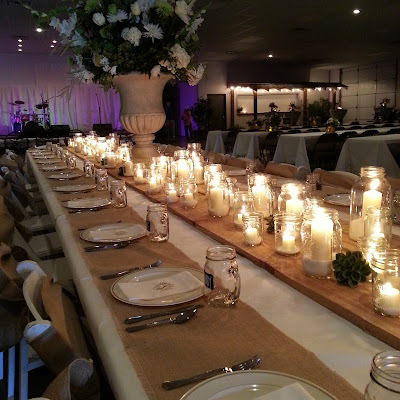 The bride wanted mason jars, and she got them! I think I used close to 100 on the head table with candles and sugar (it's a prettier color than sand), and another 300 plus full of flowers on the guest tables. Succulents were used in the bridal bouquet, bridesmaids bouquets,and all the flower arrangements in the hall and on the head table. Guessing I would say over 300 succulents were used. The fabric to cover all the tables, make the curtains and cover the stage weighted over 200 pounds! I know I said I'm not a fan of mason jars and burlap...but I really liked how it all ended up looking. More importantly the bride and groom loved the end results. The centerpiece on the head table was HUGE and weighted a ton. This was the view everyone saw when walking into the hall. I took so many pictures and then I didn't! I hate when I do that, start off strong with the camera and then set it down for a bit and loose picture taking momentum. The reception was a hit, everyone was so sweet and complimentary on everything. The bride and groom looked to have a great time as well as all their guest. The next morning they headed to Hawaii and I hit the baseball fields with Little Einstein for a tournament. I can't wait to see the photographers photos! Girl you totally transformed it!! It is beautiful!! 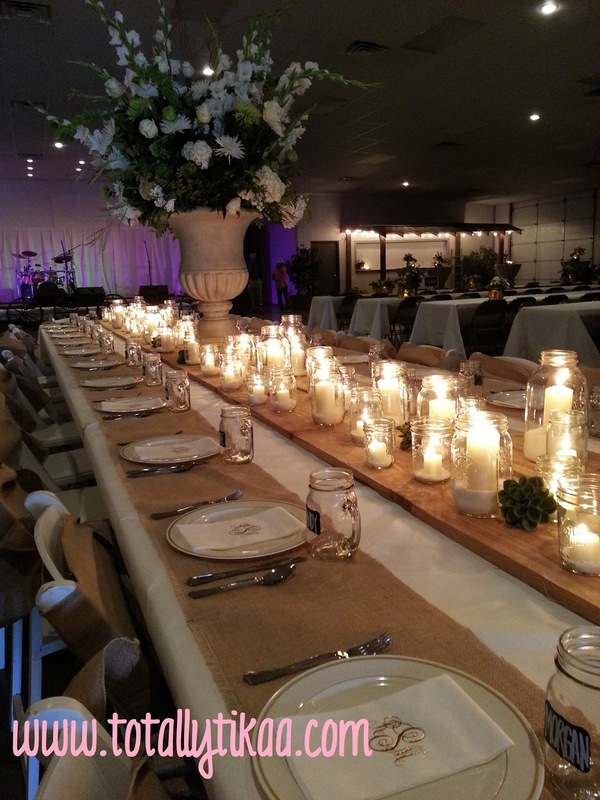 I would've never chosen mason jars at my wedding but after you made it look so elegant I would!! The bride I know was so happy!! Can't believe you couldn't even hang a curtain! Wow! You are such a great decorator!! You are my personal cheerleader. Thank you. I did kind of second guess myself... I should be the one to decorate the wedding considering the "look" was not exactly my favorite. I thought about it and decided that I could work it out. And no kidding, I couldn't attach a thing to the hall! Thanks for all your support. Great, great job Tikaa. You rocked it my girl! Can't wait to hear about it all over lunch soon. 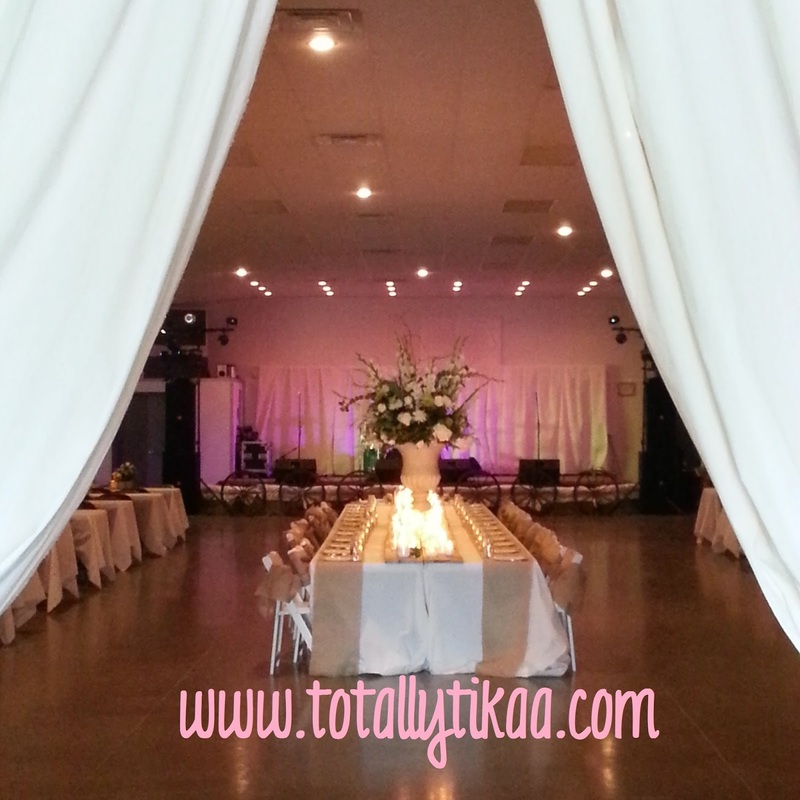 Tikaa, to say you did a fantastic job is an understatement. WOW! WOW! WOW! This really looked very pretty and inviting. I love the view that everyone saw as they walked into the room. Honey girl, take a bow! You deserve it. Bravo!!! love it! how would you even attack all of those pretty curtains without hanging them on the wall?